Remember those old Spiralgraph commercials they used to show? Those awesome designs and spiral patterns could be yours for some price that you could never afford as a kid and your parents had to be persuaded heavily to buy you such a thing. 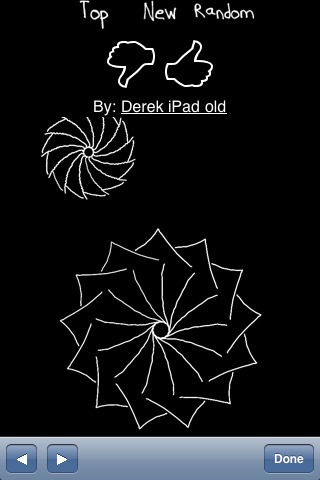 Symmetry Pro presents us a slightly slower but just as amazing symmetrical multi-line drawing app by Derek Peterson. This app is available on the iPhone, iPod touch, and the iPad for $0.99 and on the iPhone and iPod touch for the free version at the time of writing. Symmetry Pro takes the point where you touch to act as the base of your drawing. Then, depending on how many lines you want and how thick you set, when you slide your finger on the screen, it will draw that amount of lines exactly to your drawn line. Like an octopus or some kaleidoscope illusion, each time you drag your finger, you get to see an amazingly accurate ‘leg’ appear. Flowers, spider webs, gears and cogs, this app present the freedom to create anything. Then, when you have created a garden or some interstellar maze, you can then submit it for voting through the Symmetry Pro web-gallery. Tapping the screen with one finger wipes the screen clean and tapping with two fingers accesses the menu. At times, I have accidentally erased an incredibly amazing, absolutely perfect, once in a lifetime masterpiece of epic proportions (it was a yellow spider web on a lime-green background…) because my finger tapped just a tad too fast. Maybe clearing the screen could be the two finger tap and the menu could be a 3 finger tap instead since you spend a majority of the time drawing with one finger. There isn’t much too this app, but the customizability of how many lines you want for the shape, how thick you want the lines to be and the ability to draw multiple shapes and submit your pieces for popularity really allow this app to stand on it’s own 8 feet. I had a lot of fun with it and I recommend this one strongly for those of you will young children. This is a simple way to teach geometry and art through entertainment. How often can you say that about an app? AppSafari review of Symmetry Pro was written by Joseph Ho on September 30th, 2010 and categorized under App Store, Art, iPad apps, Universal. Page viewed 3341 times, 2 so far today. Need help on using these apps? Please read the Help Page.